The proven way to control your blood sugar by managing stress, depression, anger and other emotions. Dr Richard had spent about 20 years studying the relationship between blood sugar levels and the emotional state of a person having diabetes. If you read the book, you will find that the advise are all based on clinical studies being done either by himself or other researchers- not on assumptions or gut feeling. Patients are told to stay away from a diet high protein and high fat diet. Actually many people had the perception that diabetics should never take anything sweet but more findings is ponting towards a high fat diet as the cause of blood sugar control problems. He did a study whereby 50 women were fed with the Rice Diet (consists of high glycemic index food but little fat) and he found that these women lost weight and have their blood under better control. This differs from what that is commonly thought- that high glycemic food- ie food like fruit juice, sweets, white rice and white bread that converts rapidly raises the blood sugar is a no no for diabetics. Losing weight even though a little can dramatically improve blood sugar control by making your cells more sensitive to insulin. Aerobic exercises and strength training are beneficial for diabetic control. Aerobic activity improves your blood circulation and oxygen usage capacity of your muscles/organs. It burn calories, strengthens the heart which lowers the risk of heart disease (one of the complications of diabetes). Strength training helps you build more muscles and so increase your metabolic rate. It is indispensable if you want to live optimally. However, diabetics are considered to be under special population- therefore, before you begin any exercise program, you must consult a physician and obtain the clerance- but please don’t use this as an excuse not to exercise. Some diabetes patients have to go on medication or in cases of diabetes type 1, it is regular insulin injections. For diabetes patients who are not able to keep their blood sugar levels under control despite exercising and eating right, medication is usually prescribed. What happens if all the 3 above did not work? There are cases where the patient seems to be doing everything right- but still have the blood sugar going out of control. I have observed that a lot of researchers will come to a breakthrough when trying to figure out a seemingly unsolvable case. In the case of Dr Richard, it was because he was referred by his colleague to a patient named Janice. Janice was doing everything right- eating right, exercising, taking her medication- and yet her blood sugar was just out of control. The blood vessels in her eyes were wearing away and bleeding and she was losing her eyesight. She was under a lot of stress. Dr Richard taught her some relaxation method to counter her stress- a method he called progressive muscle relaxation. To his surprise, Janice’s blood sugar began to normalise. Her recovery was dramatic and her eye condition improved. She did not lose her eyesight and was discharged from hospital. 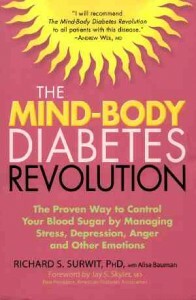 It was then that his lifelong mission of uncovering the psychological aspects of blood sugar control. The book is the result of his work- if you have tried conventional ways of controlling your blood sugar and it does not seems to work, you may take a read at the book. I have personally known 2 persons, who developed diabetes suddenly because of huge emotional shock and inability to recover from it. One of them lost her only child in a tragic car accident- and not long later, she suddenly had diabetes- despite leading a healthy lifestyle. Then, I’ve observed that when those suffering from diabetes are eating low fat diets, the diabetic is under better control. I have a friend whose both parents suffer from diabetes- the mother faithfully followed a low fat diet while the father, being stubborn, tended to eat outside food which is oily and fattening. He also stole ice cream from the fridge to eat a night while everyone’s asleep. The father later had a wound that refused to heal- my friend had to do dressing. The old man finally toned down his bad eating habits after warning from the doctor that his leg would be amputated if his condition worsens. In absence of stress- such as on a relaxing holiday or retreat, the blood sugar of a diabetic seemed to be under control even though the diabetic takes on the same diet, but cut down on high fat food. I know this because I’ve travelled and lived with diabetics while I was abroad- a more forgiving and relaxed outlook of life really makes a difference. It really does. Negative emotions and feelings like stress, anger, depression, hostility bears a negative effect even on a healthy person. More so if you or a loved one is suffering from diabetes, there is really nothing to lose by learning to lighten up from inside out. From a study, Dr Richard found a strong connection that a hostile person is much more susceptible to a heart attack. RELATED: Exercise frequency 15 minutes a day or 1 hour once a week is better? 1. Exercise– a good workout always make you feel better. 2. Read more positive self help books that emphasize a lot of positive thinking. 3. Seek professional help like therapy or counselling. There is nothing wrong about seeing a counselor or therapist- if you find the charges too steep, you can try find out counselling centers run by NGOs (non profit organisation). But whatever you do, please ensure you get help if the stress, anger and depression in you is going out of control. Hello, fine and advisory article. I want to add a few mentions. If you have high cholesterol, then you may inquire, will a low fat diet lower cholesterol? This is a vital inquiry, because it is a good known fact that the most efficient way to lower cholesterol is through diet. For Certain one component of a diet for lowering cholesterol will take on being low in fat. Merely this is entirely part of the history. It is important to pull in that it is the concentrated fats that you want to eradicate it from the foods you eat. Hi, thanks for your valuable feedback. Yes, diet is a very important consideration when it comes to controlling cholesterol. However, this article was written specifically for those who tried all 3 methods- exercise, medication, food control but could not control their blood sugar. It is meant for the readers to reaccess their stress levels.